Online retailers are wonderful for convenience and late night shopping, but New Yorkers also love the experience of shopping at a store with a personal touch. 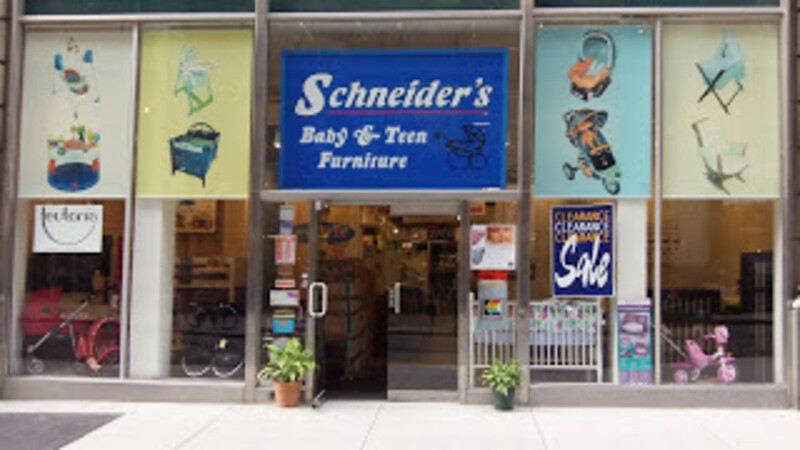 That&apos;s what you&apos;ll find at Schneider&apos;s.
They have been in business fro 59 years--so they know a thing or two about babies, baby gear, and baby furniture. There is nothing slick about Schneider&apos;s. They know about furniture and value quality. What I love most about this shop is that they provide honest service and strong opinions. Lorraine is my go-to resource at Schneider&apos;s. I stop in every few months to get her take on trends and new brands. If they pass Lorraine&apos;s standards I&apos;m impressed. She is a wealth of knowledge for new parents looking to set up a registry. Right now Lorraine says Teutoniastrollers are strong sellers with Bugaboo and Uppababy also making strong showings. Schneider&apos;s customer&apos;s don&apos;t seem to be skimping, but they are opting for timeless looks--cribs and baby furniture with a simple contemporary feel and clean lines. There is always something new to see--this time around it was the hand painted murals from Sam Simon. "I want referrals and for customer&apos;s to be happy," says Lorraine. Customers can walk the spacious store and see more than a dozen cribs set up and accessorized. Parents to be can also special order from a wide array of brands. Want to take a stroller for a test ride? Feel free. You wont&apos; feel rushed here.